In 2011 we updated the website onto “blogging” software, with the result that we can update it more easily, and we can also allow our friends and volunteers to do the same. As a result, this page will not be updated, and our more recent activities will be put on the blog page – time permitting! – we don’t just rescue swans. Cardiff Bay Barrage – 29th November, 2008. 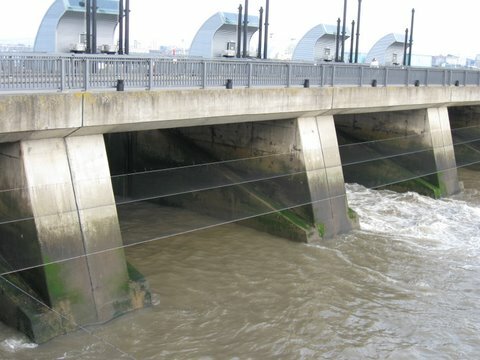 The Cardiff Bay Barrage, completed almost ten years ago, encloses an extensive area of still water, holding back and controlling the waters of the Ely and Taff rivers on the northern edge of the Severn estuary. Its construction was one of the largest UK civil engineering projects of recent times, and created a very considerable storm of protest before building began as a result of the consequent loss of an important Site of Special Scientific Interest and Ramsar site; the tidal flats were of prime importance for large numbers of wintering waders. A significant feature of the barrage is a fish pass, which itself cost £93m. This allows migratory fish, particularly salmon and trout, passage from the sea into the rivers and so to their spawning grounds up river. One inevitable result of this is the natural concentration of large numbers of fish in the immediate area on the seaward side of the barrage. Again, inevitably, this situation attracts numbers of anglers to an area which is of very significant danger. Despite the very best endeavours of the barrage staff, in their quest for fish such as Sea Bass, anglers have persisted in fishing in the clearly prohibited zone. In response, the authorities felt obliged to take extreme measures. Firstly, they tried placing 2 metre high Heras security fencing on the edge of the parapet close to the water’s edge. Undeterred, the anglers merely produced ladders to enable them to cast from the top! Finally the measure which worked, and which cost £150,000 to install, took the form of near-horizontal netting mounted on tensile steel supports cantilevered out some 3 metres from the three sides of the fish pass entrance, and some short distance above the high water mark. Of itself, this did not stop the anglers from casting, but having done so, their lines could not be retrieved from beyond the outer edge of the netting. As you would expect, there’s a downside. 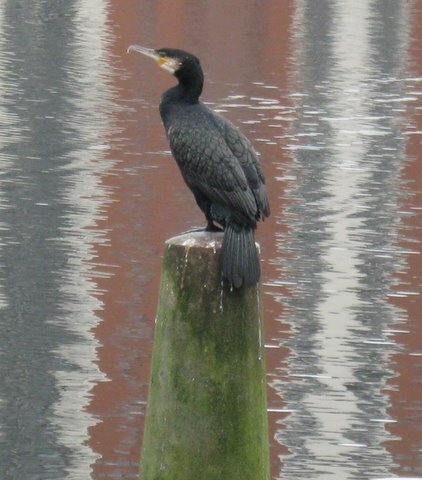 For cormorants, an accumulation of fish is a fantastic natural larder, and so it was only a matter of time before birds would become snared in the netting. The first time it happened the authorities were able to act quickly, launch a boat and get to the bird in time to free it unharmed and release it. In this area the critical success factor is the state of the tide. In the estuary the typical tidal drop (range) is 11 metres, and so there are many times of the day when an approach is physically impossible. We became involved more recently when another cormorant became caught. Not that we were expected to catch the bird! We simply wouldn’t have been allowed to take to the water on account of the danger. The problem was that, at a time of year when there is limited daylight and on a falling tide, would the bird survive a very cold night until a rescue bid could be launched? As a measure of just how seriously the authorities were taking the situation, they explored the possibility of hiring a 500 tonne crane at a cost of £5,000 to gain access from the top of the parapet. Such a large crane would have been required simply because this was the only device with a jib long enough to reach the cormorant. In the event, no crane was available. We suggested the fire brigade but even their equipment would not reach far enough and so we just had to hope he would not perish during the night, and await a phone call hopefully, early the following morning. The call did come, and the cormorant was alive. We made what has now become the routine dash to Shepperton where we knew would be best treatment available. Fortunately, contrary to what had been feared, the bird did not have either a broken leg or wing – just severe bruising, and all ended well. One of our rescues involves a female swan with a fractured femur. This swan had already suffered stress, having been injured a week earlier; on that occasion it had been caught by the RSPCA for a badly cut underside which needed veterinary treatment involving stitching. A long way from home: At the time the call came through from Gary, our rescuer in Port Talbot, we were more than seventy miles away on our journey back from a meeting with the Environment Agency. Gary had been contacted by an employee of the Sony firm in Pencoed near Bridgend, (his name incidentally, is Tony – ‘Tony from Sony’), who had become concerned about the lone swan on one of their ponds. He had noticed she was using only one leg to paddle with. Running out of time: It was late afternoon when we received the call from Gary, and there was less than one hour of daylight left, so it was important to find extra help from someone who would be able to reach Pencoed much sooner than we could. We telephoned Dai at the Caerphilly Mountain Countryside Service; they are always most supportive of the work we do. Fortunately Dai was available, and he made his way to Pencoed immediately with a boat. Trouble at the Pond…or is it?? : When we arrived at Sony our security passes were ready waiting for us at the main gate. As we reached the larger of the two ponds, although it was dark, we were just in time to see the swan which had been frightened by the boat fly over our heads to the adjacent pond where there was a resident pair of adult swans with one of their cygnets. This prompted an added worry which we could not have anticipated. Swans can be very territorial, particularly when they are protecting their young. Clutching our torches, nets and waders we stumbled across to the other pond as the resident adults were preparing to chase off the ‘intruder’. With wings up and heads back they made their way across the water towards the injured swan but each time she managed to avoid them. Little did we realise it at the time the swans were actually helping us by driving the swan closer and closer to the bank side where we were waiting with nets poised. Finally after about an hour and a sudden burst of enthusiasm by the parent birds, the swan was driven near enough for Gary, with a whoop of triumph to drop his net over her. Thanks to territorial instinct: Without the help of those amazing birds, this rescue would have been extremely difficult. This is the first, and will probably be the only time when we will ever be thankful for that strong territorial instinct. Later that evening the swan was taken directly to The National Swan Sanctuary at Egham for treatment and after-care. On the 18th January Ellen Rang me and asked if I was available for a rescue at Swindon. Sue, a Swindon Council Ranger and “Swan Rescuer” had been keeping an eye on a Swan that had developed a bulge in the neck – possibly due to swallowing discarded fishing line. Ellen explained that not only might the hook be down inside the Swan, but the bird might also be “chin-strapped”. This is where a loop of the line gets caught under the bill, causing the tackle to “stop” on what might otherwise be the “course of nature”. This blockage can stop the Swan feeding, and in extreme cases, can actually cut through the bill. I made a few suggestions for possible local canoeist contacts in the Swindon area (either British Canoe Union names or Scouting addresses – the Scout Association being the biggest single user of canoes in the UK). I also agreed that I would accompany Ellen to Swindon the following day. I duly presented myself at Ellen’s, canoe (for the purists, it’s a Kayak!) on the roof rack, kit in the back, and hoping that I hadn’t forgotten anything important! We travelled to Swindon, chatting about “Swan stuff”. Ellen’s been calling me out for over ten years now, but I still don’t really know a lot about Swans! The Swan was on a small lake located in a suburb to the West of Swindon (next to a VERY impressive Chinese pavilion restaurant). Sue was already there, along with some volunteers that she had rousted out, along with a small outboard inflatable from a local water sports centre. The inflatable was puttering around the lake, following the Swan, which was having nothing to do with it! I struggled (and I do mean struggled!) into my wetsuit, and joined the party on the water in my canoe. The lake was probably about one hundred metres by two hundred metres, with a couple of small islands or peninsulas. The build up of reeds between one bank and one island made it difficult to be sure of the shape. I followed the bank in the direction that the Swan had taken, with the island on my right. The channel got narrower and narrower, until it was narrower than my paddles, but the inflatable had got through, so I could. After about thirty metres, the channel opened up into a small clearing, with a Swan and inflatable in it. Catching a Swan from a canoe is almost impossible, so it was time to get out. The Swan was off up another reedy channel, so I followed it to block the channel, and clambered out. The water was only about a foot deep, but by the time I was out of my canoe, the Swan was legging it across the land towards the main part of the channel, and away! With a few “Swan Catchers Curses”, it was back into the boat and follow it back across the lake. As we returned to the main part of the lake, another two canoeists joined us, so there were now three people in the inflatable and three kayaks chasing this poor bird (which had a damn site more energy than us!) up and down the lake. At one end of the lake the Swan realised there was nowhere to go, so up went the skirts, and the Swan pounded down the lake, before flying just above the surface, gently coming to land on the other channel going around the main island. We followed it, and gently shepherded it with the aim of driving it onto the land, where it might be grabbed. The Swan had other ideas, however, and swam into the reeds. The canoeists followed until we ran out of water. Now it was going to get interesting! Reeds are not the best foundations, as was proven when I put some weight on one foot and went into silt up to the ‘nads. By crawling carefully, we could move onto firmer mud, but by now the joke about the Hellawi tribe of pygmies* was becoming relevant, and we had lost the Swan again! We spent about five minutes confirming that we couldn’t find it, before it was spotted gliding up the lake. Crawl back to the canoes, and try to get back in without taking all the reeds and mud that were stuck to our legs. Back to the other end of the lake, where the inflatable and the non-muddy canoeist had the Swan cornered again. Again, the Swan clambered into the reeds, but a bemused passer-by on the road just above the lake discouraged it from going too far. I scrambled out of the canoe again, using a nearby fishing platform, and moved to cut off the last escape route along the bank. Realising that it was trapped, the Swan made a dart for freedom between the canoes and the inflatable, but it wasn’t quite quick enough, and with a fine rugby tackle (so I’m told!) I grabbed it’s body – with me face down in the water – and distracted it enough that the people in the inflatable could grab its neck. A few minutes sorting ourselves out (and nearly dropping the bird in the process!) and the Swan was safely wrapped in a bag on the floor of the inflatable. By the time we were all back on the shore, the Swan was apparently calm, although I doubt that he was really enjoying the attention. Closer examination revealed a tight chinstrap of line. And that was about it. The team went their separate ways, Sue taking the Swan to a nearby vet, where it was found that the blockage in the neck was caused by a ball of fishing line, but mercifully, no hook. *The Hellawi Tribe are pygmies that live in an area covered in long grasses. They are named for their habit of continuously shouting out the greeting “We’re the Hellawi!”. There are another similarly named tribe living nearby, but we’re not going to mention them!